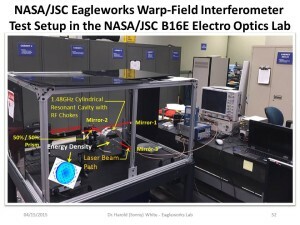 My last post detailed the possibility of a ‘warp drive’ derived by NASA, mentioning NASA’s work on an ion propulsion (or electromagnetic [EM] drive). Yesterday, NASA brought out more information on the EM drive. This new technology already has NASA looking at manned missions to Mars and back taking under a year, or a mission to Alpha Centauri taking less than a century. Another variation from normal scientific research: “A community of enthusiasts, engineers, and scientists on several continents joined forces on the NASASpaceflight.com EM Drive forum to thoroughly examine the experiments and discuss theories of operation of the EM Drive.” In other words, a long discussion occurred between scientists on the NASA public forums, which helped to examine and discuss the results of NASA’s test. And yet NASA decided to test it to make sure. This tickles me pink because NASA did not give in to the nay-sayers, those people in the ‘scientific community’ who insist that things cannot be done any differently than they’ve already tried. I have high regard for ‘the scientific community’, but it does like to rest on old ideas at times. As a community, it’s very conservative in that it wants everything to follow the accepted scientific theories as though they were laws. Stephen Hawking, the brilliant physicist who has created, debunked, and formulated more scientific theories than any other current scientist, is still theorizing. Even though he’s proved some of his own theories wrong or misconceived, he works on more and more, building on successes and failures, to create more theories to be considered, debunked, or accepted. And it’s people like Hawking and organizations like NASA that will someday take mankind to the stars and beyond. Because they’re not afraid to try things that ‘conventional wisdom’ says won’t work. It’s so impressive, so mind-boggling, so… absolutely through-the-roof-past-the-moon-out-of-this-galaxy amazing, that scientists are now considering the possibility of sending technology to study the next star system. And that this is even considered speaks realms about the scientists who refuse to say ‘impossible’ and, instead, test new ideas. This is what science is all about. Great post BJ. Just the other day I watched a link from Buzzfeed, which showed our “neighborhood” (Earth) relative to it’s placement in our solar system and beyond. To say it was mind boggling is a tremendous understatement. As I watched it, I couldn’t help but shake my head. Earth appears like some evolutionary speck propped against an infinite array of other worlds. It’s almost scary.